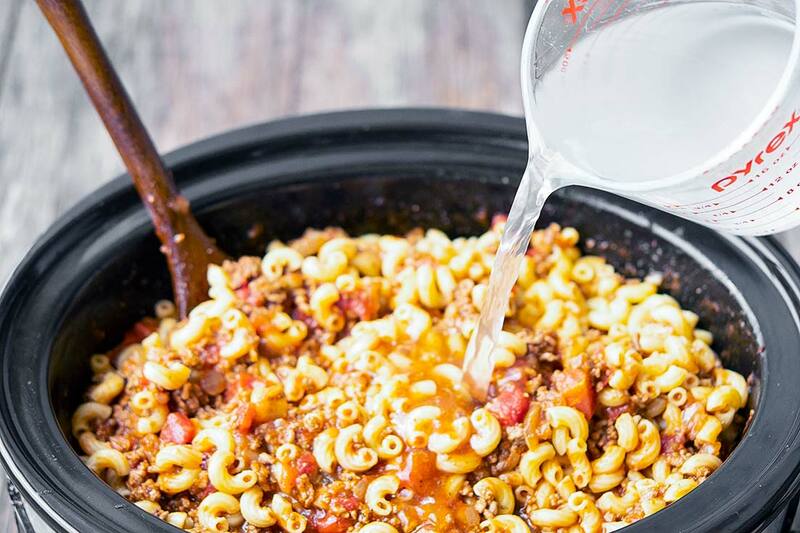 Whether you call it gulyas, gulas, gulyasleves, gulasin, gulasch, or plain old crockpot goulash, you’re gonna relish this humble American version of beefy noodle herdsmen dish! If you have been eyeing the Hungarian goulash slow cooker Food Network advertises, my crockpot goulash recipe is your ticket to the Americanized bigtime. Take a break from worrying about marrying off your children, or whether it is better to marry for love or economics, and instead try marrying some beef and noodles for a wholesome family feast! Like so many of our meals in this land of hustlers, what began as the humble chow of sons of the soil has colored the cuisine of entire regions and evolved into a widely popular dinnertime delight. 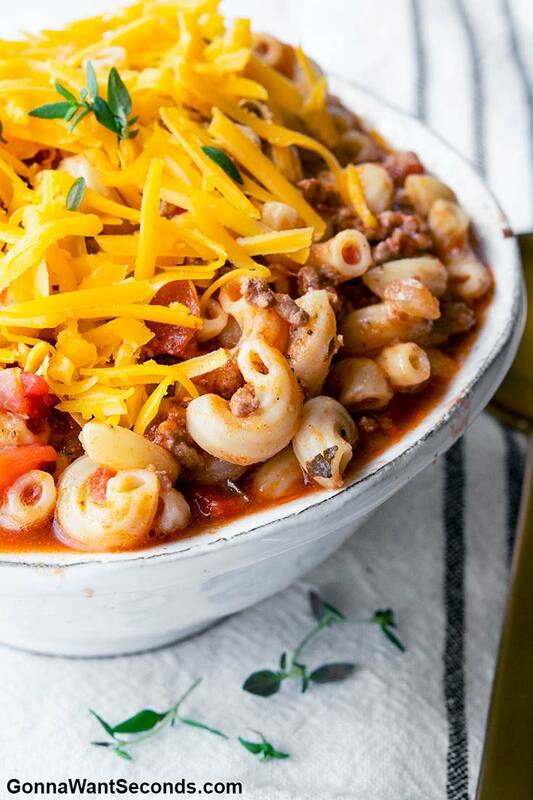 If you like this goulash, you will definitely want to sample my American Chop Suey, Cheesy Chili Mac, and Beefaroni comfort food! 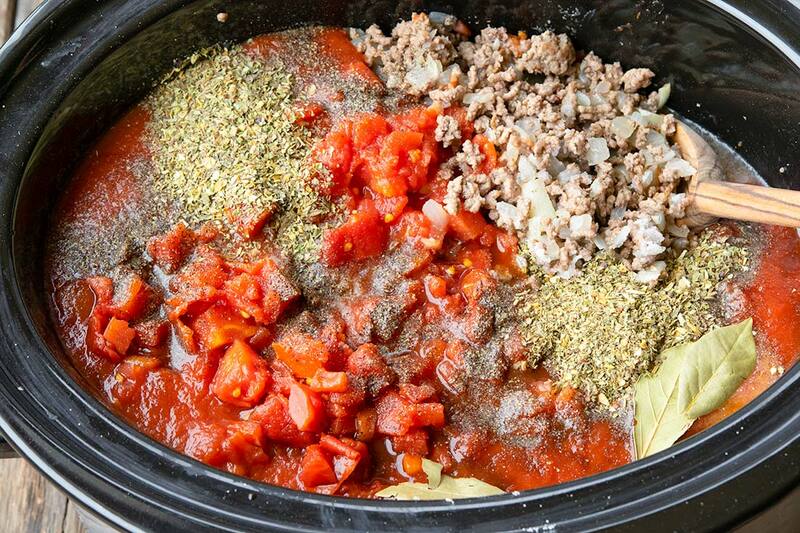 My crockpot goulash is made with a couple pounds of 80/20 ground beef and two cups of elbow pasta, along with onion, garlic, tomato sauce, and canned petite diced tomatoes. (Some people make crockpot goulash with tomato soup, but I prefer the heartier sauce and diced whole tomato combo.) My sauce also makes use of soy and Worcestershire sauce, salt, pepper, Italian seasoning, and bay leaves. After browning the beef and cooking the onions and garlic, simmer everything but the pasta in a crockpot for several hours. Add the pasta at the end and sprinkle on some cheese for good measure! Now your hamburger goulash with elbow macaroni is complete! 1. In a skillet, brown ground beef over medium-high heat. Removed excess oil. Add onion and garlic to the beef and cook until the onions are translucent. 2. 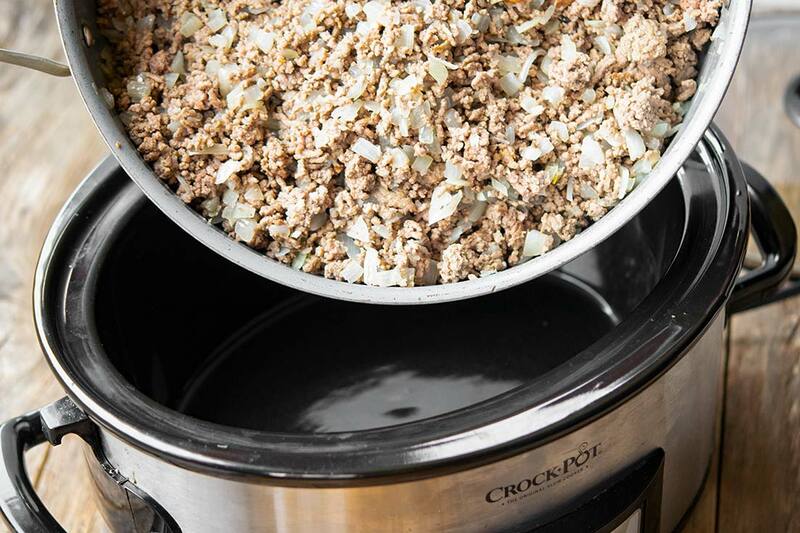 Transfer mix to a large crockpot. 3. Add water, tomato sauce, petite diced tomatoes with their juice, soy sauce, Worcestershire sauce, sugar, salt, pepper, Italian seasoning, bay leaves. Stir. Cover and cook on high 3-4 hours or low 7-8 hours. 4. Meanwhile, cook pasta in well-salted water, according to package instructions. Reserve 1 cup of pasta water. 5. Drain pasta well then stir into crockpot. 6. Add reserved pasta water 1/2 cup at a time to thin sauce slightly. Sprinkle cheese over top and serve. 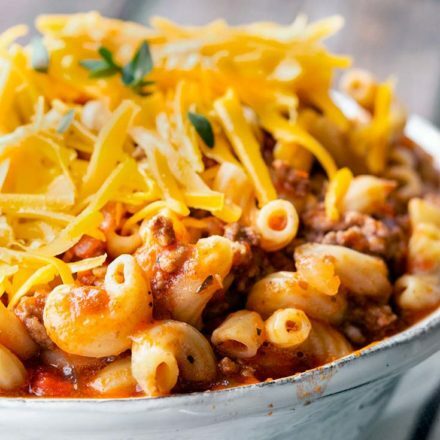 American Goulash, also called ‘slumgullion,’ or simply ‘goulash,’ is a home-style ground beef, tomato, and pasta dish popular in the South and Midwest. Some people also make crockpot goulash with corn, and I don’t begrudge them it, but I think the garlic, onion, and tomatoes provide plenty of texture as is! Fun fact: you can find goulash recipes in American cookbooks dating all the way back to 1914. 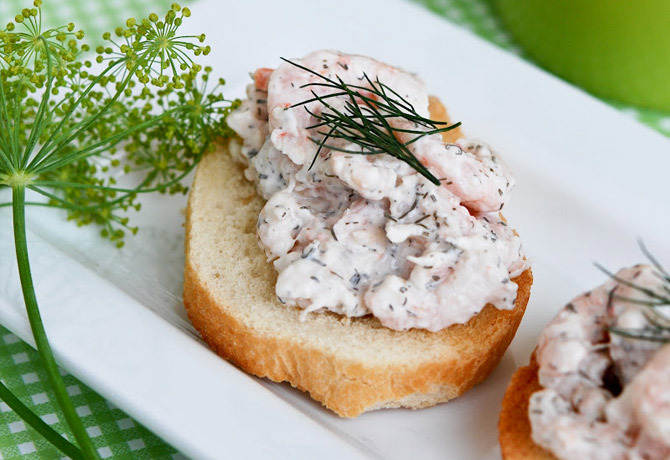 One recipe I referenced is from over a century ago, believe it or not! — it employs butter browned cubed round steak, paprika, and tabasco sauce. (How long has tabasco been around, anyway? Apparently since 1868, according to my search engine!) 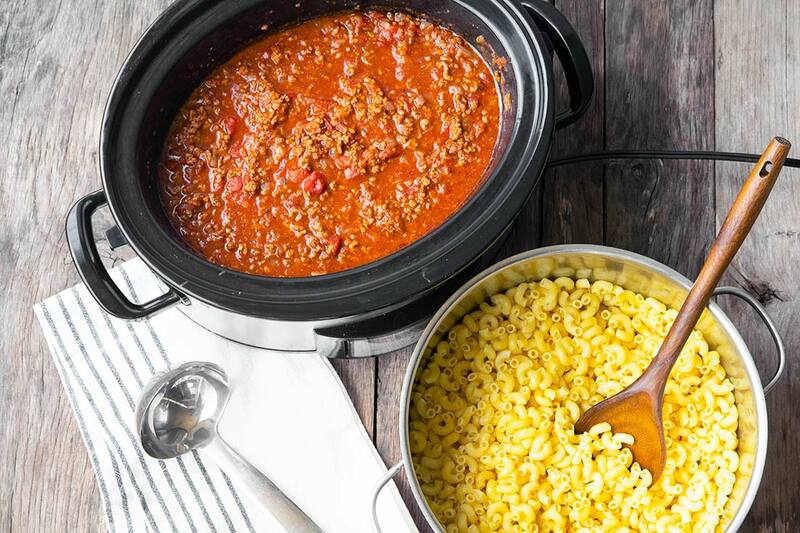 In this slow cooker hamburger goulash, however, I stick to ground beef and Worcestershire sauce (which has been around since 1837.. even longer than Tabasco!!!). 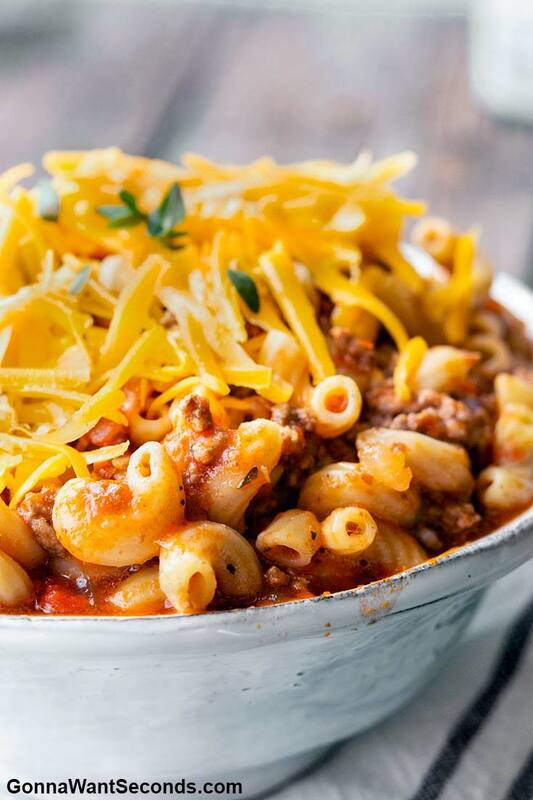 How Is Hungarian Goulash Different From American Goulash? Hungarian goulash is more of a brothy slow cooker goulash soup or stew. (To be fair, the goulash slow cooker Jamie Oliver makes is also a soup.) 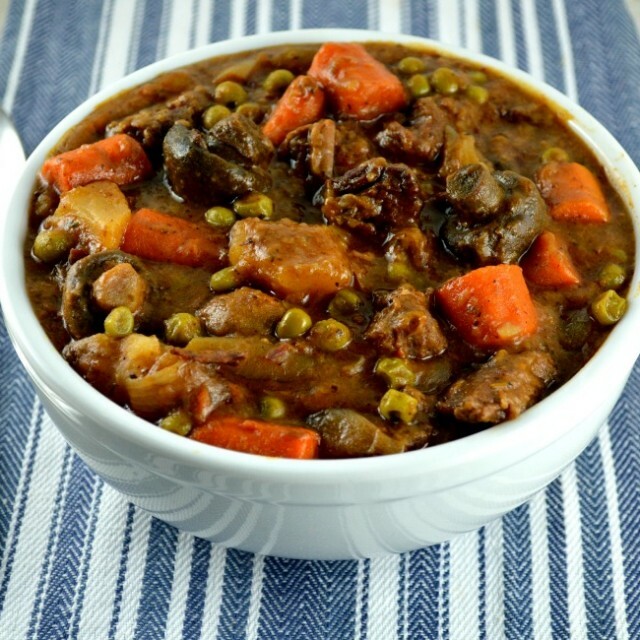 It uses some combination of potatoes, dumplings, stew meat, peppers, and other vegetables. On a historical note, goulash actually originated with humble Hungarian cowherds! The term ‘goulash’ even comes from the word for ‘herdsman’! The original recipe used something like lard, onions, millet, and salt. So next time y’all gobble down its American descendant, tip your hat to these intrepid laborers. If you are looking for a Czech goulash recipe slow cooker style, be warned that this variety is also more of a stew. As they say in the Czech Republic, “Bez peněz do hospody nelez,” or, “don’t go to the pub without money!” For Czech goulash, you might need to pick up caraway seeds, hot peppers, breadcrumbs, and marjoram. It is also typically served over chewy dumplings. As traditional wisdom has it, variety is the spice of life. Czech goulash sometimes uses pork, and Americans sometimes make beef goulash with a chuck roast! Cubed and seasoned chuck roast is a satisfying alternative to ground beef. 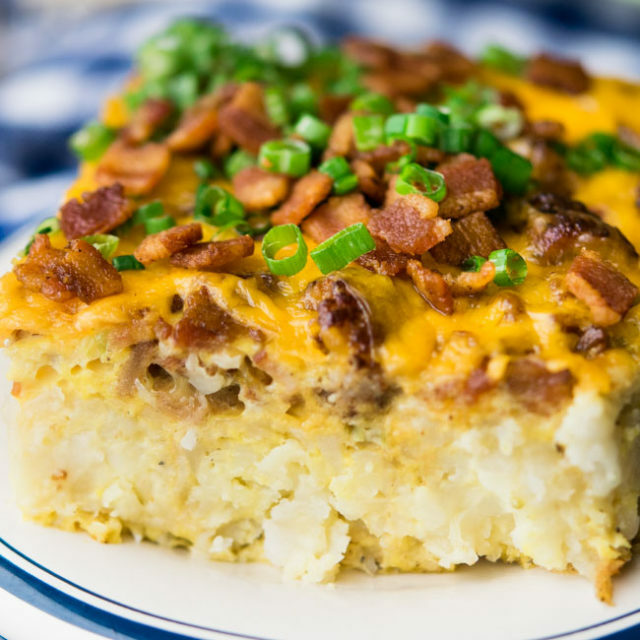 Next time you make this recipe, give the chuck roast version a try! I know I always appreciate having a few varieties in mind so I can keep my family’s weekly meal rotation fresh. 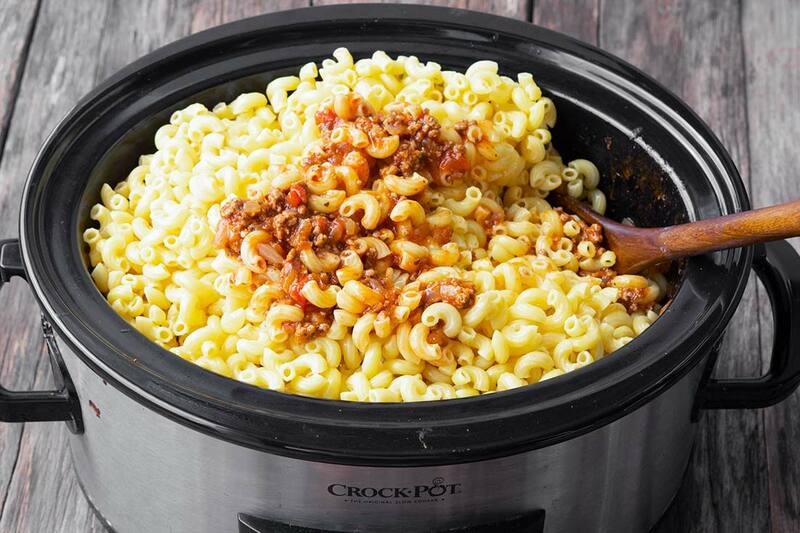 Here are a few notes to aid you in your crockpot goulash recipe journey. Can you make ahead of time? Yes indeedy! Just hold off on preparing the noodles until you are ready to serve. Store the meal in the fridge for up to four days, and in the freezer for up to four months. 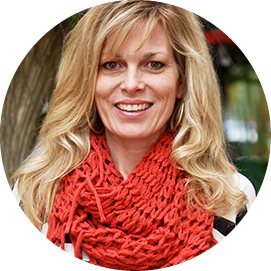 How do you freeze? This recipe doesn’t require any special freezing instructions besides holding the noodles! 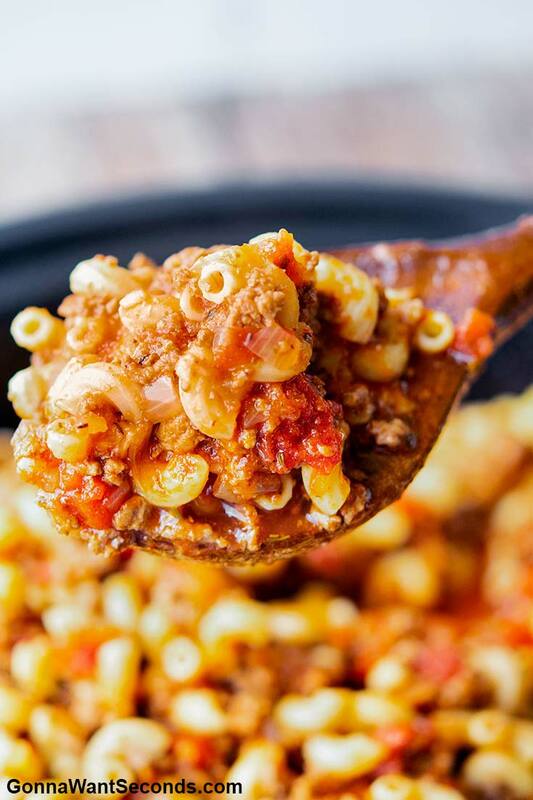 Let your goulash cool before freezing, use a proper container, label the container, and reheat the goulash within a few months for best results. 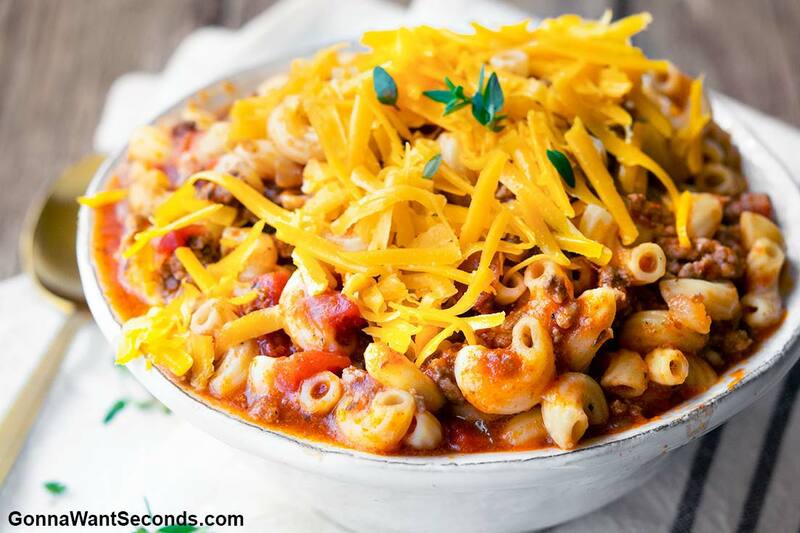 What do you serve with goulash? 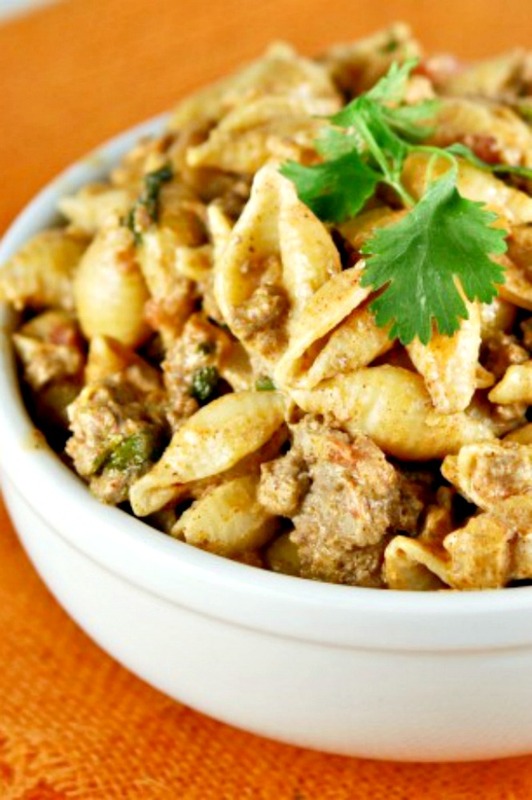 Goulash is a great standalone dish. 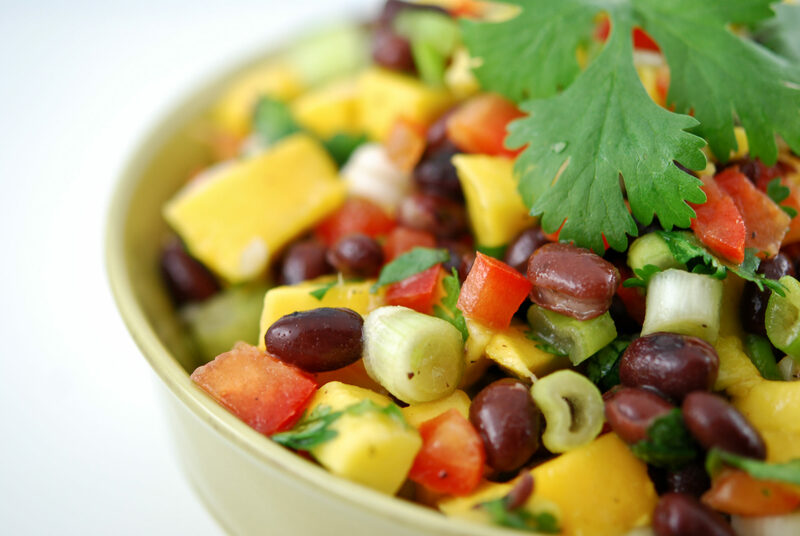 If you want to go the extra mile, serve it with a light fruit or veggie salad! If you are aiming to stay on theme, crunchy zucchini fries and potato rosti are two suitable Hungarian side dishes. Why cook the pasta separately? This allows you to build a thick sauce and also prevents you from overcooking the noodles. 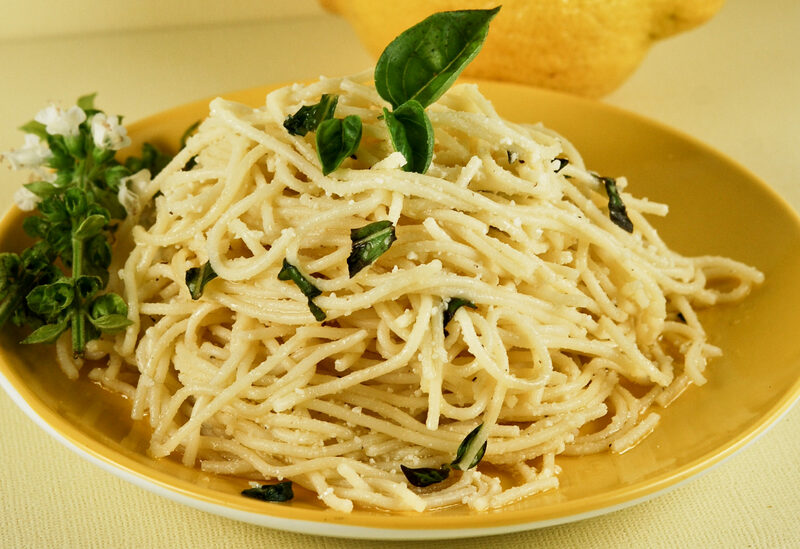 If you prepared the sauce with enough water to cook the noodles, it would turn out too thin! And if you’re not careful, you might end up with a pasta mushier than the snow lingering outside my window! 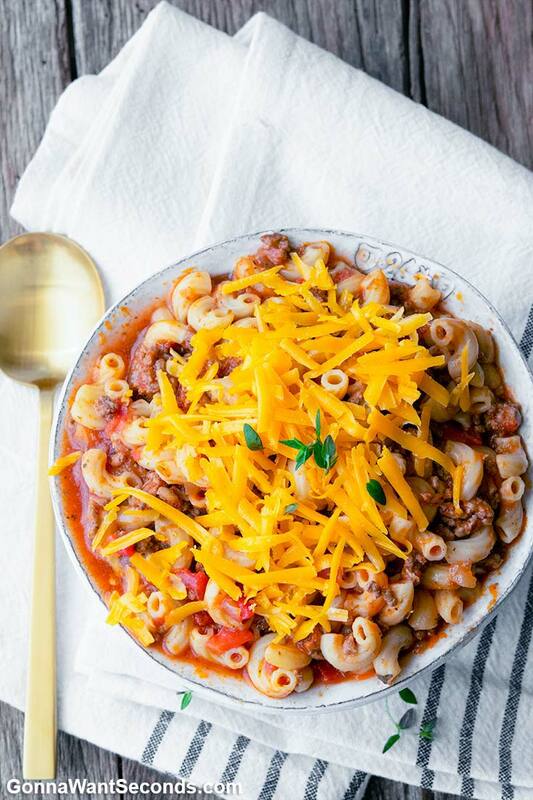 Whether you call it gulyas, gulas, gulyasleves, gulasin, gulasch, or plain old crockpot goulash, you’re gonna relish this American version of humble beefy noodle herdsmen dish! 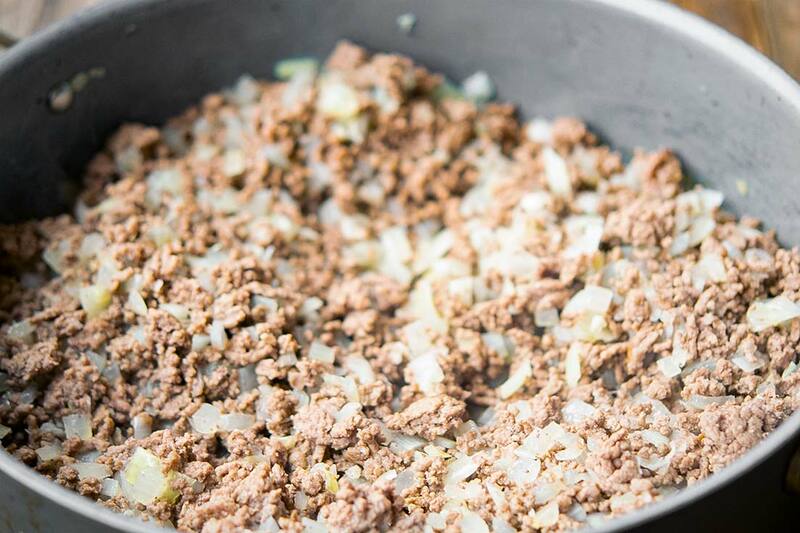 In a large skillet, brown the ground beef over medium-high heat, crumbling with as it cooks, until browned on both sites (It doesn't have to be cooked all the way through). Remove excess oil. Add onion and garlic to the beef and cook until the onions are translucent about 10 minutes. Transfer mixture to a large crockpot. Add the water, tomato sauce, petite diced tomatoes with their juice, soy sauce, Worcestershire sauce, sugar, salt, pepper, Italian seasoning, Bay leaves and stir. Cover and cook on high 3-4 hours or low 7-8 hours. Meanwhile, cook the pasta in well-salted water, according to package instructions. Reserve 1 cup of pasta water. Drain well then stir into crockpot. Add reserved pasta water 1/2 cup at a time to thin sauce slightly. Only add more pasta water if consistency needs adjusting. Sprinkle cheese over top and serve. Going to try this yet on the instruction #3 where it says add water how much water? I only see adding pasta water at the end?